Marikina has been synonymous to the shoe industry, being the largest manufacturer of shoes and bags locally but let's not forget about Lilac Street (and its surrounding areas), which has also always been famous for being a dining destination for food lovers, along the likes of Aguirre Avenue in BF Homes Parañaque, Maginhawa Street in Quezon City and Kapitolyo in Pasig. Baliwag is the household name when it comes to rotisserie chicken and grilled pork belly, and a staple for any family celebrations. Famished and need something ready to eat that's delicious and filling? Having friends over for a night of food and drinks but you're lacking on the food department? Head to the nearest kanto along the way and grab an order of Baliwag's whole chicken to appease your rumbling stomach. The usual Baliwag stores I know are the to-go shops that can be found almost everywhere that is accessible. So I was quite surprised when we went to a Baliwag sit down restaurant. 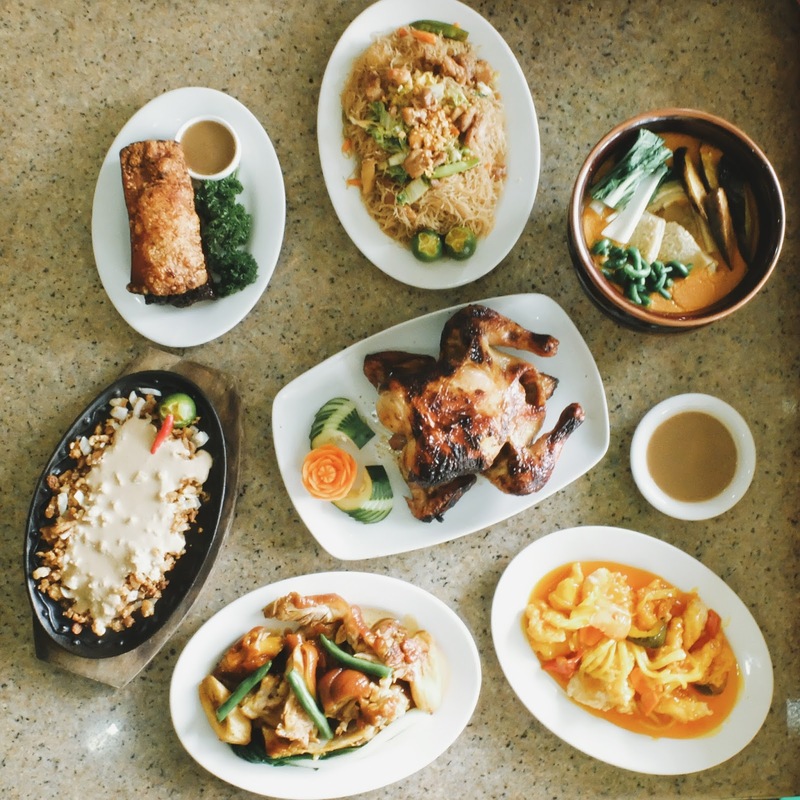 And another surprising thing: they've got so much more than chicken and liempo! We got to taste (aside from their bestseller lechon manok) their pancit bihon, kare-kare, pork sisig, and lechon kawali, along with other Filipino favorites. I was really impressed by the variety of food they order! I was always under the impression that they only have grilled chicken and pork! My favorite would be (surprise, surprise!) the kare-kare (because I rarely eat kare-kare and I only eat the vegetable kind) and the pork sisig. I loved how it was served to us still hot and crispy and flavorful! Overall, food was good as well as their service. The phrase "lutong bahay" warrants a place that has a homey, cozy feel to it and that was my expectation of this restaurant. I never frequent Antipolo or Marikina so I actually had no idea about Nicandro's. At first glance, the interiors actually looked nice. I liked the tables and the set-up. The space was small and it felt a bit cramped. We were served Beef and Ox Tripe kare-kare, Pinakbet sa Bagnet, Sinigang na Baka sa Bayabas and Deep Fried Baby Squid. For our drinks, it was a choice between their house blend iced tea and sugar cane juice. I opted to skip the kare-kare for the reasons I stated above and focused on the other dishes. My top pick would be the Deep Fried Baby Squid! It was perfectly seasoned and the crispy batter somehow got that little melt-in-your-mouth feel. I don't know if it's just me or what. Haha. I really enjoyed eating that. Number two would be the Pinakbet sa Bagnet because I love bagnet and they also did a great job on this one! I usually pick the pork and leave the veggies but this time I enjoyed both. Perfect with a cup of rice! The Sinigang na Baka sa Bayabas was a foreign concept to me. I love my sinigang sour and this had more sweetness to it -- yes, because it was guava-based. It was just okay for me. And while the other foodies chose their house blend iced tea over the sugar cane juice after tasting it, I liked it. Sure, it tasted different but it was really refreshing. Especially excited for this one BECAUSE JAPANESE FOOD! 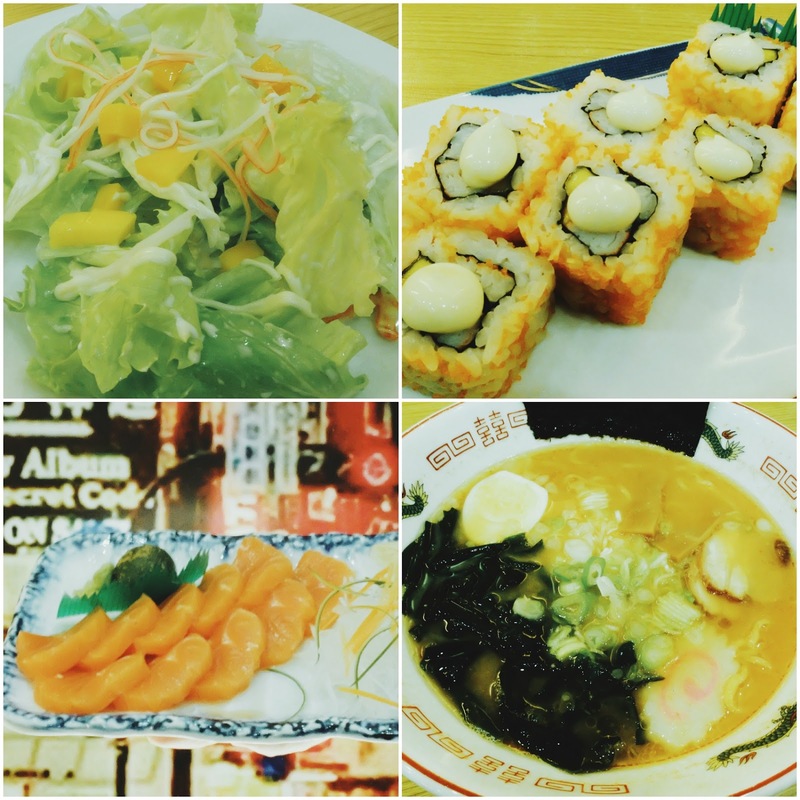 Fukurou Nihonyori is s small resto located inside Blue Wave Mall in Sumulong Highway. Nothing fancy, just straight up your Japanese favorites. On our table were the following: kani salad, California maki, salmon sashimi and shoyu ramen. In a nutshell, the food was okay, nothing spectacular or exceptional but not bad at all -- just okay. I thought the kani salad's serving was small... or too few, I guess? Or they could use a smaller plate when serving that too avoid it appearing... small. I liked the California maki. It's a quick fix for your maki cravings considering the price. Their shoyu ramen was okay, too. My favorite would be the salmon sashimi! It tasted fresh with every bite. Yum! We had one foodie on board, Mona, who has not eaten a single sashimi in her life! We challenged her to take one bite and she gave in after a lot of hesitation. But I guess it's safe to say raw food is not everyone's cup of tea. I remember in college I hated California maki and I could not understand why my classmates seem to love it because they always order it when we go to Tokyo Tokyo way back. Haha. Miguel & Maria has always been on my list of restos to try because I've been hearing a lot of positive feedback about them. I wasn't able to see the entirety of the restaurant because us foodies were seated on a certain area and the place was packed by the time we got there in the afternoon. But from the outside, it looked like a house remodeled to a restaurant. We had their Baby Back Ribs, Ultimate Burger, Baked Salmon, and Mac and Cheese. I just have to say that this is my favorite stop because most of the dishes were delectable. 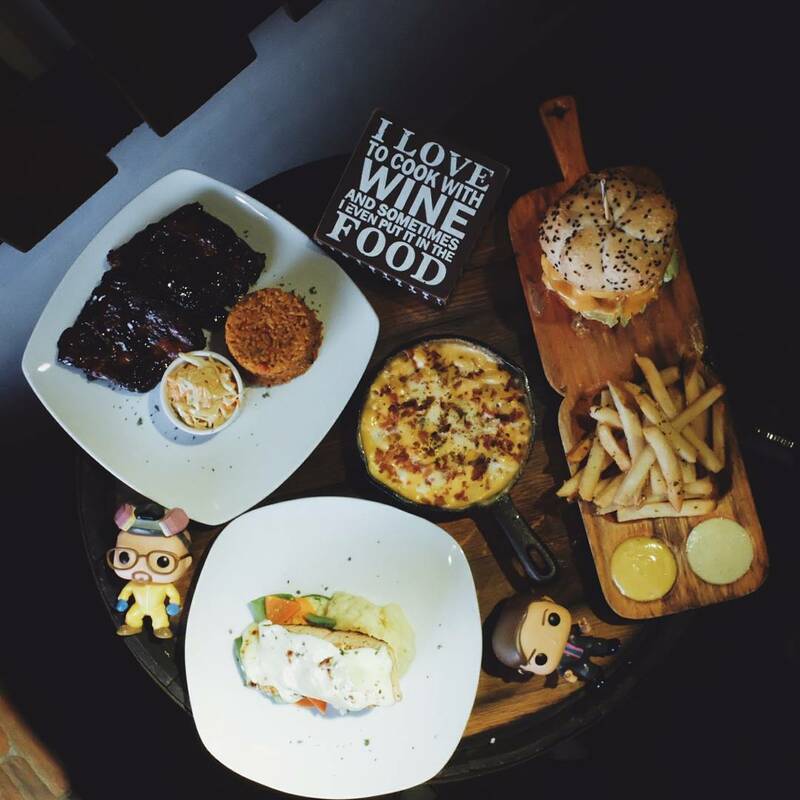 Their baby back ribs and mac and cheese are a must try! It's really, really sumptuous and a joy to eat! The baked salmon was okay but the side of mashed potato, for me, was the true star of the dish. After roaming the Marikina-Antipolo area straight from work for almost half a day, I began to feel worn out by the time we reached Brad and Pit's. But somehow the interiors of the restaurant give that energetic vibe, you can't help but get infected and perk up. We were served this beautiful spread of food. And it's got everything from nachos to ribs to dynamite sticks to chicken wings to sandwiches. The ones I were able to try that night were the ribs (of course) and the Carribean wings, paired with their version of dirty rice. 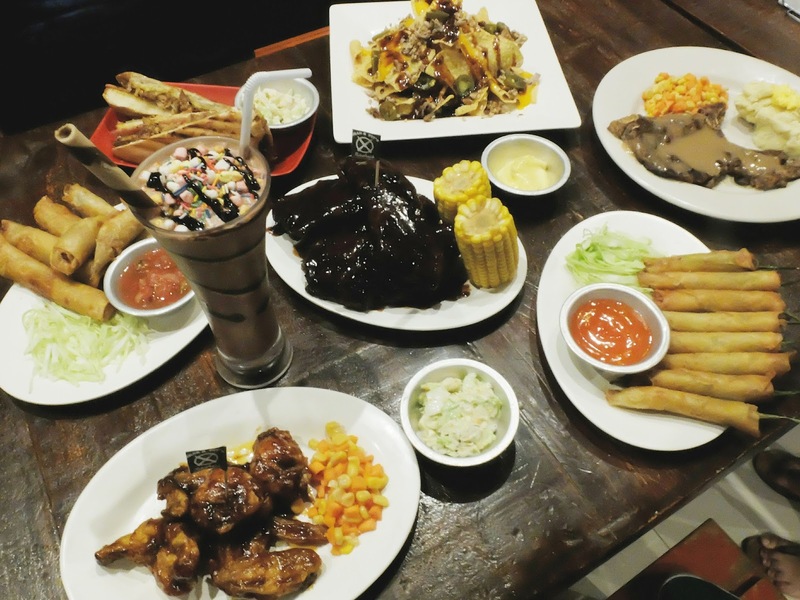 Try these dishes and the carnivore in you will truly be grateful to you. Even though I was already quite full with all the food we had that day, I can't help but munch these meats that were super tender and flavorful! If there was a Brad and Pit's near work, I would definitely frequent it for these! Honestly, by the time we got to Cafe Lidia, I was just looking forward to eating cake. It's almost 9:00 PM and we're still eating and at the back of my mind, I craved for something sweet to end the day. 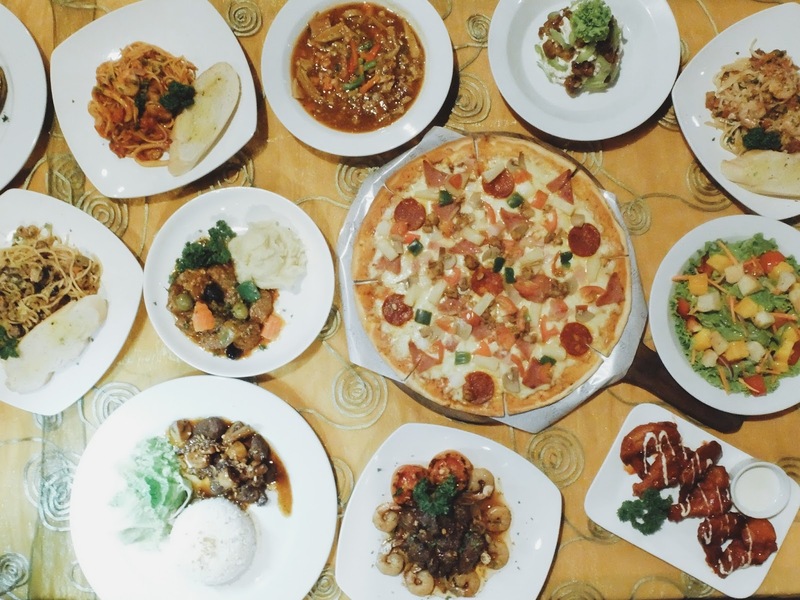 If you're going to ask peeps from Marikina which restaurant they would recommend, Cafe Lidia, I'm pretty sure, would be in the list. It's one of the pioneering restaurants in this area and from what I've read online, a go-to place by people through the years for celebrations and gatherings. It's got the homey vibe perfected (complete with indoor garden and falls!) and a wide range of food at reasonable prices. We had 2 tables of food that night (the photo is just a part of the whole thing haha) and because I was already too full, I only got to taste around 3 dishes. First was the Dad's Special, which I found really flavorful and tender, and if only I were not bursting to the point I would profess to not eat ever again, I would have chowed this down with rice. Even better because it had pieces of shrimp in it! The other two dishes were the pepperoni pizza and buffalo wings which I found okay. My ultimate favorite(s) from Cafe Lidia would be... the cakes~! A bunch of us were too excited for the cakes that we forgot to take photos at all. Haha! We ordered the Chocolate Dream Cake, Ube Cake, Blueberry Cheesecake, Classic Sansrival, White Chocolate Sansrival and Mocha Sansrival, and all of them are delicious! I swear, we were eating off of each other's plates just to try everything because we all said the same thing: the cake's great! And that ends my once again gastronomical adventure, this time to the East. courtesy of the amazing people from Zomato! (Thanks, Louie and Trisha!) Do you have a Zomato account? Let's follow each other! Click on this link to go to my profile! Click on the restaurants' names to know more information about them.